Launched in 2011, the LM1 introduced watch collectors to a singularly fresh take on traditional watchmaking. Said to be inspired by 19th century pocket watches, the LM1 presents a traditional features not seen in previous MB&F models: a round case, white lacquered dial and blued steel hands. However, it does that in an extremely modern configuration and underneath a spectacular sapphire dome. The most visually striking element is the balance wheel, presented on the dial side of the watch hanging theatrically over two white lacquer dials featuring independent time displays. The watch is powered by a beautifully crafted manual-winding movement, created by Jean-Francois Mojon and Kari Voutilainen, with a 45-hour power reserve indicated by a vertical indicator at 6 o’clock. The LM1 was an instant hit when it was launched, receiving both popular and critical praised. The watch received both the Public Prize and the Best Men’s Watch Prize at the Grand Prix d'Horlogerie de Genève in 2012, shortly after its release, and inspired an entire range including a perpetual calendar version. Now discontinued, the LM1 was made in four different metals: rose gold, white gold, stainless steel and platinum. The present example, made shortly after the presentation of the LM1 at the Basel Watch Fair, is the second of 33 made in platinum. A modern masterpiece, the present lot is preserved in outstanding condition. 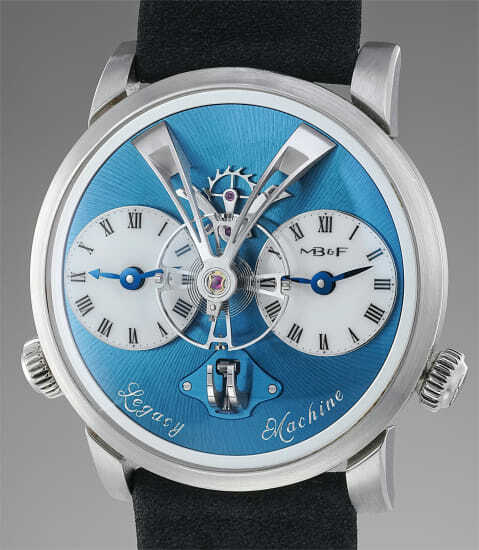 It is an extremely rare opportunity to obtain one of the rarest Legacy Machines, from one the MB&F’s earliest advocates. Please note that MB&F will offer a full complementary servicing of this watch to the new owner.